It’s not unusual for a popular manga or anime series to be treated to a variety of spin-offs in Japan, but today I’m here with a look at something a little different: a spin-off created by a western author. 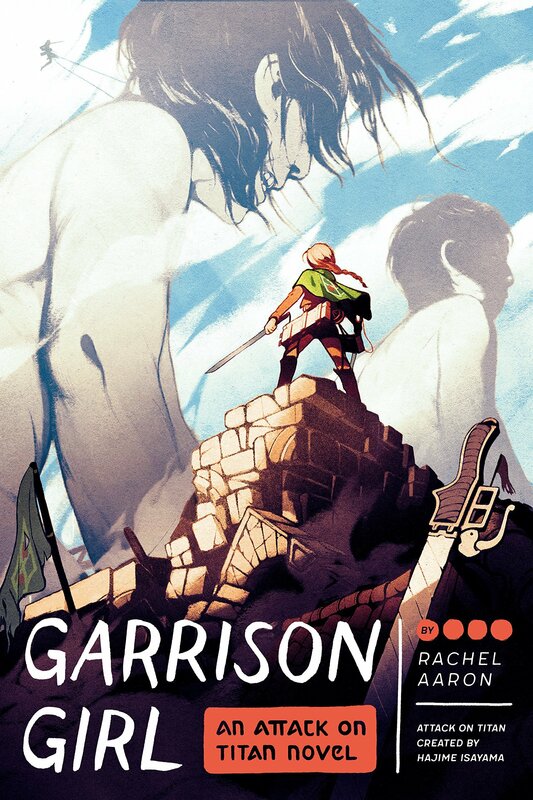 The Attack on Titan universe has been given an incredibly rare treat with a story written by a popular American author, Rachel Aaron, in the form of Garrison Girl. How well does this book portray the world of Attack on Titan that we’ve come to know over the years? Our story revolves around Rosalie Dumarque, who, as a member of a noble family, has enjoyed a peaceful and cushy life. With six months before she’s due to be wedded, Rosalie convinces her father to allow her to do as she pleases with the time and freedom she has left. Her dream is to join the Rose Garrison, protectors of the farthest standing wall between humanity and the fearsome titans. When faced with the poverty caused by the fall of Wall Maria, and the titans themselves, will Rosalie regret her choice or stand to protect mankind? Garrison Girl is a coming of age story that grips you and ensures you keep on turning the pages. The overall premise of the story isn’t that original to me – a rich, pampered girl going out and finding her place in the world (or just getting to see the world beyond her home at all!) – but what really drives this story is Rosalie herself. The story might be hitting all the beats you’d expect from this kind of tale but the characters make it worth sticking with. Of course, the other thing Garrison Girl has going for it is the setting. I’ve spent a lot of time with the world of Attack on Titan, following both the main series and its various spin-off stories, so my interest was piqued straight away by this different take. However, even if you’re someone who has only seen the main series, this book will likely still capture your interest. Attack on Titan only really needs the walls, titans and various squads to work. Everything after that falls to individual writers and what they want to do with it. This has worked especially well for author Rachel Aaron, who has chosen to focus on the Wall Rose Garrison; a group we’ve not really seen much of in other media (which usually follow the Survey Corps). Focusing on the Garrison means that we don’t have the usual high drama of the Survey Corps or the inner politics of the Military Police Brigade, and it instead gives us a look at daily life for those who protect the walls. It gives Rosalie the chance to strike up firm friendships with her squad mates (eventually) and grow as a soldier in a safer environment than we’d normally see. All of this comes together to offer something unique in the world of Attack on Titan both to newcomers and veteran readers of the series alike. It’s not like anything that has come before. Where the writing is concerned, author Rachel Aaron (who has 10 fantasy and sci-fi novels to her name) has done a brilliant job. Nothing about this book feels unnatural to the world it’s depicting and Aaron obviously cares a lot about the series that mangaka Hajime Isayama has created. She characterizes her cast well and the titans are just as intimidating as they are in any other part of the Attack on Titan franchise. I especially like the decision to have a strong female protagonist, which I often feel is absent in this universe. While I did criticise the plot earlier for having a stereotypical set-up, I certainly can’t complain about how well it has been executed. Overall, Garrison Girl is yet another entry in this huge franchise that deserves to be in any fan’s collection. This is a really intriguing project to have been created on western shores instead of coming from Japan, and in some ways I think that’s enough of a compelling reason to check it out. No matter why you pick the book up, I’m sure you’ll stick with it until the end. Garrison Girl is everything I find fascinating about Attack on Titan in one gripping instalment.